We're in the midst of summer now, and any long-term visitor of Japan knows what summer here means: Weekend after weekend of crepuscular booming in your neighborhood! 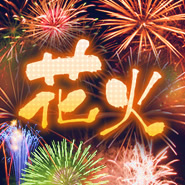 Event news and entertainment site WalkerPlus just listed its annual Fireworks Display Calendar, with a cute (and highly distorted) little map of Japan you can click on to find dates and locations for fireworks and summer festivals going on wherever you live or are visiting in the country. Once you pick an event, take care to arrange your method of travel and accommodations beforehand. Large displays in Japan are well-known for their massive crowds, blocking off whole segments of cities from vehicular traffic, tying up mass transit lines for hours following the grade finale, and booking their city's hotels solid. This might sound strange, but despite this being my 6th summer in Japan I have NEVER seen any fireworks here. Either I was busy at work and couldn't go or I was traveling to the wrong places during summer time.